Well, you can’t win ’em all. Or even most of them if you’re the 2013 Phillies. They dropped another game today, losing to the Cubs 4-3. It’s the 74th time they’ve lost this season. Methinks they’ll be finishing below .500. In a game where neither starting pitcher was able to make it beyond the fifth inning, the two teams traded runs back and forth through the first six innings before shutting it down completely. An incredibly sloppy ballgame (seriously, it looked like little league at points), neither team was very sharp, and the Cubs simply outlasted the Phils. 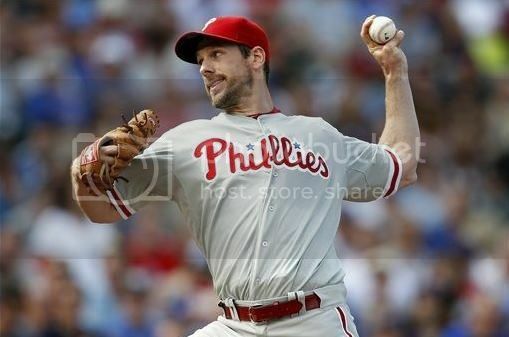 – Cliff Lee just didn’t look himself today. His usual pinpoint control was slightly off, and it cost him. And while he didn’t pitch terribly, he just didn’t dominate the Cubs lineup the way he probably should have. In fact, he failed to even record a single 1-2-3 inning. By the time the end of the fifth inning rolled around, Lee had thrown 113 pitches and was finished, allowing three runs. He struck out four and walked three. – Many would argue that Lee was squeezed by home plate umpire, Jim Reynolds. But realistically, Lee simply has to be better against a team like the Cubs. He didn’t get the job done today. The five-inning start was tied for his shortest of the season, the other coming in his first start in August against Atlanta. – Bating with two outs in third, Chase Utley was able to reach base when Anthony Rizzo inexplicably missed an easy throw from third that should have ended the inning. Pressing his luck, Utley attempted to steal second with Carlos Ruiz at the plate. The throw beat Utley by a mile, but would get passed Darwin Barney, allowing Utley to steal the bag successfully, at least according to the official scorer. The two misplays (only Rizzo’s gaffe was rule an error, as noted) wouldn’t have hurt the Cubs, if not for Chooch’s two-out double, which scored Utley to give the Phils the lead. In the third inning, Cole Gillespie‘s misplay on a line drive to right, where he failed to coral a carom off the side wall, allowed Lee to score on what should have been a single. Two of these plays weren’t officially ruled errors, but they’re plays big league teams should make. Fortunately, the Cubbies were unable to do so. Sometimes lady luck shines on even the most misfortune of baseball teams. Though, as the outcome of today’s game shows, the luck didn’t pay off. – For the second straight day, Kevin Frandsen hit a solo home run. After being the best pinch hitter in baseball during the first half, Frandsen has struggled mightily since the All Star Break. But he has now homered in two straight games on top of a triple he hit yesterday. Perhaps the best bench player on the Phils is finding his groove again. He’s been a bright spot this year. – As many predicted, Michael Young has been a butcher at third base this season. His clunky hands would cost the Phils a run today, which proved to be the difference. With two outs, he booted a Donnie Murphy ground ball towards third. As so often happens in baseball, the error would end up costing the Phils when Murphy came around to score. Young has been hitting better of late (he went 3-for-5 today), but his glove remains a liability. – Taking over for Lee in 3-3 game, Zach Miner didn’t waste much time in allowing the go-ahead run. His second pitch of the day was sent into the seats by Starlin Castro. That would be all she wrote. The homer was Castro’s first in a month. The baseball gods giveth, and the baseball gods taketh away. -The Phils and Cubs play a grudge match tomorrow at 2:20 p.m. Kyle Kendrick (10-11, 4.40) takes on Jake Arrieta (1-1, 4.50).